STORM - (Standing Together to Organize a Revolutionary Movement) was a Bay Area, Maoist leaning revolutionary group active from approximately 1995 to 2002. Three STORM leaders also traveled to South Africa in 1998 for the South African Communist Party conference. 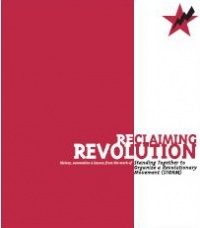 According to "Reclaiming Revolution" page 37 several STORM members traveled to Cuba in 1999 with the Venceremos Brigade. One of the most formative "political education sessions" of this period was a group trip to Cuba in the summer of 1999. Several STORM members participated in the Venceremos Brigade to see and support one of the world's few surviving socialist states. Members came back with a heightened understanding of both socialism and capitalism and a stronger commitment to red politics. STORM associate Mei-ying Ho-now Mei-ying Williams traveled to Cuba with the 2004 Venceremos Brigade. When the last sixteen STORM members decided to dissolve, each committed as an individual revolutionary to helping this emerging trend continue to consolidate. Some are finding other ways to serve the people.